I’ve lived in Colorado my entire life and it still surprises me how little I have explored. And if I have explored a certain place in the past, there is always something new to find every time I go back. Boulder is that place. And honestly, Boulder is f*cking awesome. I say that because I went from Boulder straight to Austin in the same week and the food was incredibly disappointing compared to Boulder. 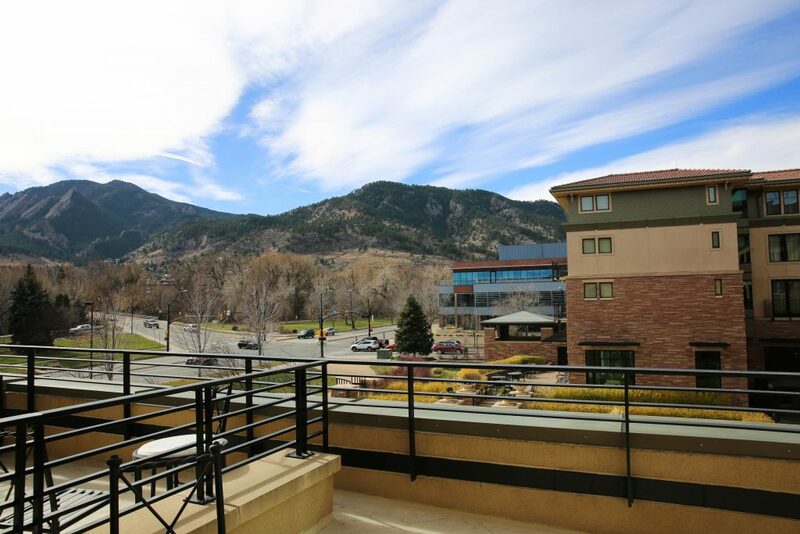 Boulder has everything to offer: from food, to shopping, to the great outdoors, to some of the best cocktails you will ever taste. No wonder it was named 2017 Happiest City in the US by National Geographic. What else would you want in your own city?! Even though Boulder is only a 30-40 minute drive from Denver, it’s still a place I rarely visit. I stay in my Denver bubble. Which is stupid because Boulder has some of the best restaurants in the state along with amazing small boutiques and shops. So today I’m going to tell you about some of my favorite things to do, where to stay, what to eat, and where to wash it all down. That way, whenever you visit Boulder, CO, you know exactly where to go as soon as you drive in! 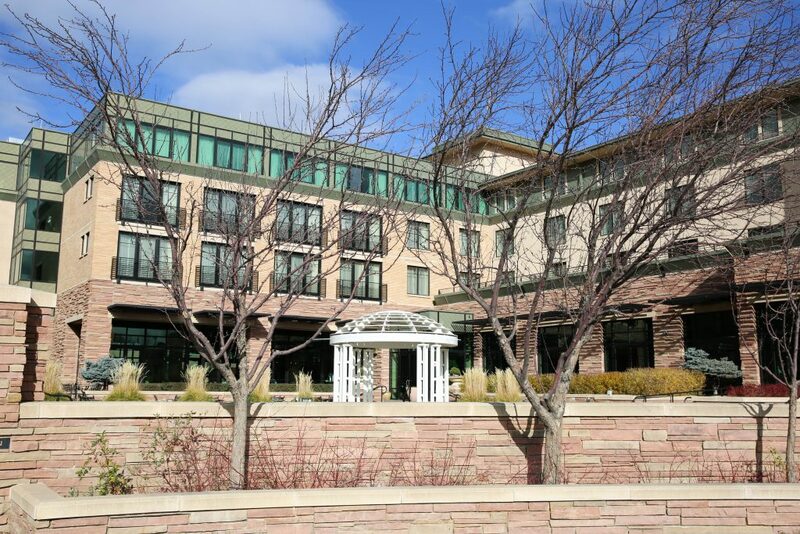 If you’re looking for a beautiful place to stay that’s in the heart of downtown Boulder, in walking distance to everything, all with a beautiful view – well you need to stay at the St Julien Hotel and Spa. The service at this hotel is outstanding. I’ve traveled all over the place and this hotel is incredibly professional, polite and helpful at any hour. 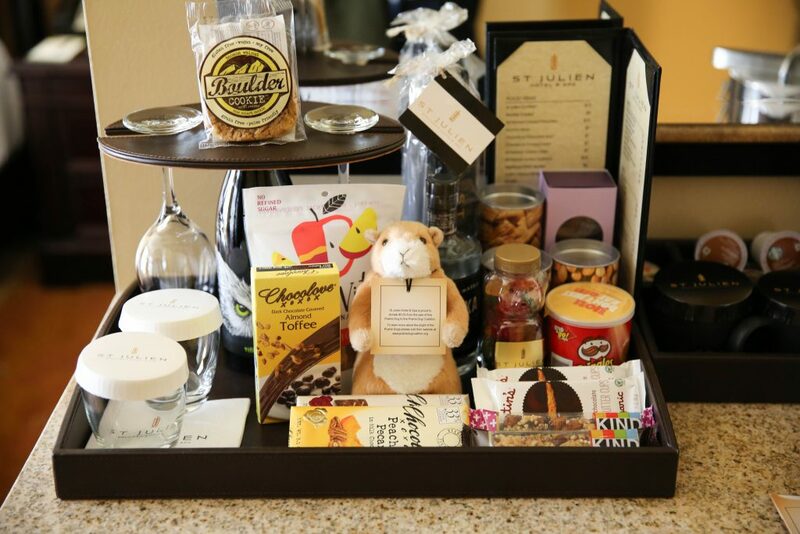 I stayed in an incredibly comfortable room that had a walk-out balcony that overlooked the Flatiron Mountains and was packed with local snacks and treats. The hotel offers a spacious lobby with a giant fireplace that I bundled up in front of daily. It wasn’t even cold when I was there but it was so cozy and comfy, and they serve you food and drink while you’re cuddled up on the couches. And after warming up, I tried out the hotel’s restaurant called Jill’s that serves absolutely delicious food! I had breakfast and ordered the hash, asked for no eggs (since I stay away from eggs because of an allergy), and added sausage. It was booooommbbb. For some reason I always question if hotel restaurants are any good but I’ve honestly had some of the best meals of my life from hotel restaurants. And Jill’s did not disappoint! But the best part of St Julien Hotel and Spa and the main reason why staying there is so great, is definitely their spa. They have a beautiful and peaceful spa that makes you feel comfortable and pampered. 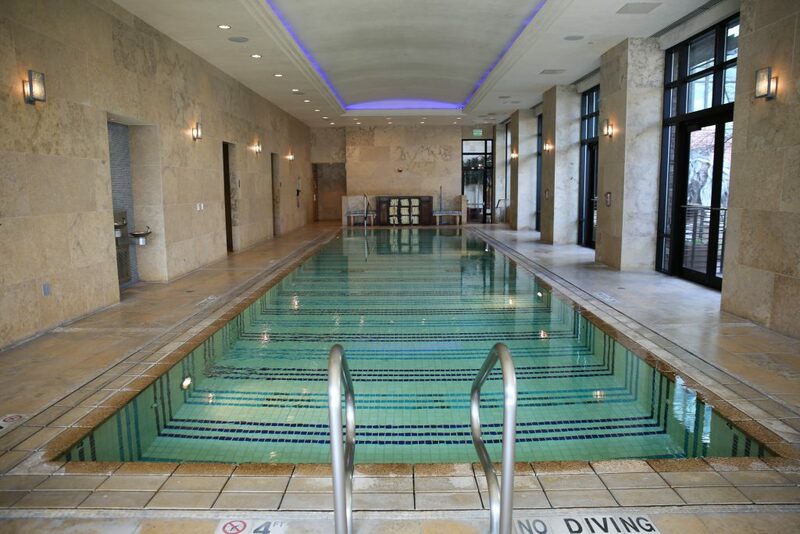 The space is attached to a huge pool and hot tub while having it’s own individual saunas and steam rooms. I was lucky enough to try out their 90 minute massage that included a body scrub to begin with and a light massage after. I almost always get deep tissue massage and getting a light one was magical. I actually fell asleep during it because I was so comfortable, which NEVER happens. Then I was instantly depressed when it was over. Oak at Fourteenth – During my stay in Boulder, this was the first restaurant on my list. 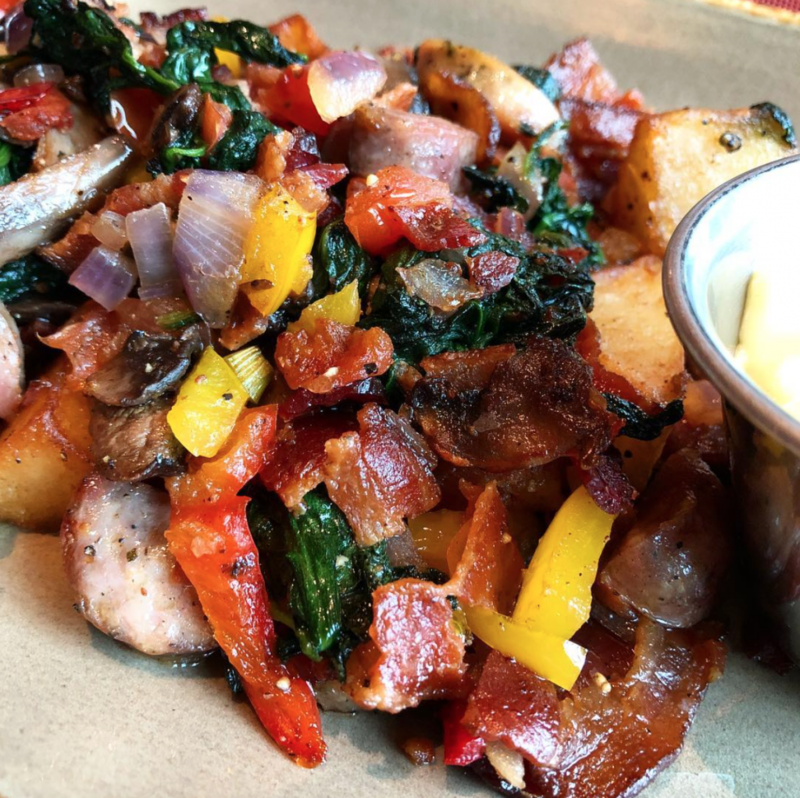 This restaurant has a one-of-a-kind, oak-fired oven and grill and a seasonally inspired menu. They feature locally grown vegetables, locally sourced meats, and sustainably raised seafood. I tried a salad that was AWESOME! And I hate salads. 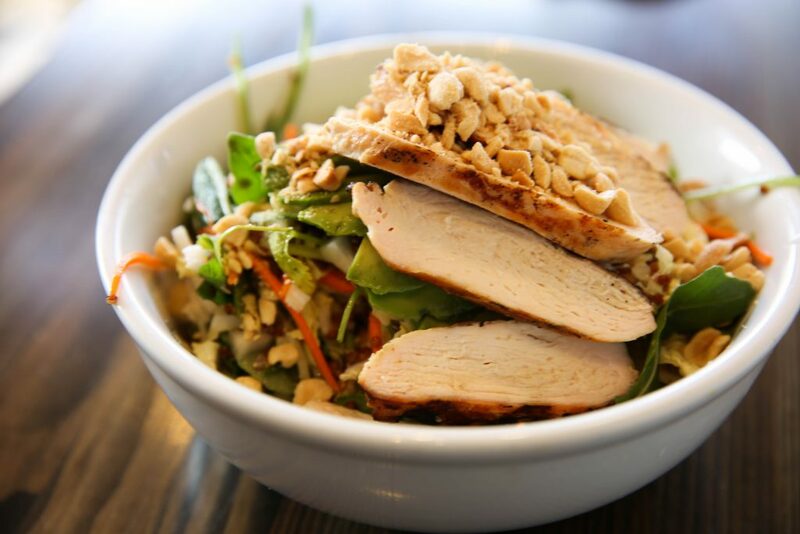 But this lemongrass grilled chicken & quinoa salad was outstanding. And gluten free! OAK also offers hand-crafted cocktails and artisan wines and beers, but since I was eating lunch on a Monday by myself, I stayed away from the cocktails. Day drinking by yourself is just sketch. If you’re at this restaurant, simply ask what items are gluten free and they will be happy to tell you even though it does not say on the menu. Anywhere in Boulder is great about this and it’s incredibly easy to find gluten free items while eating out! Bramble & Hare – Second on the list, this adorable tiny restaurant that almost feels like a little hole in the wall. But a super cute and cool hole in the wall. This restaurant is in the middle of Downtown Boulder and offers farm-to-table menu items with craft cocktails. I decided to try their 3 course meal so I started with their beet salad with a lovely beet cocktail on the side, then tried their BBQ pork, and finished the meal with a panna cotta. If I can recommend anything, it’s come hungry when you’re trying this restaurant out. Their portions are big and their ingredients are hearty! It’s pretty damn hard to put your fork down here. 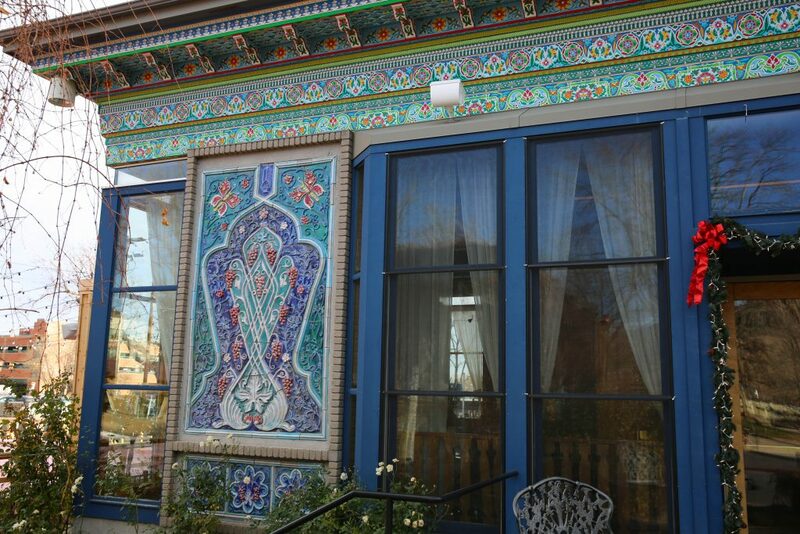 Boulder Dushanbe Teahouse – Of all the places I’ve been in Boulder, this is my absolute favorite. And I’ve been talking about it nonstop and recommending it to all of my friends since I tried it. 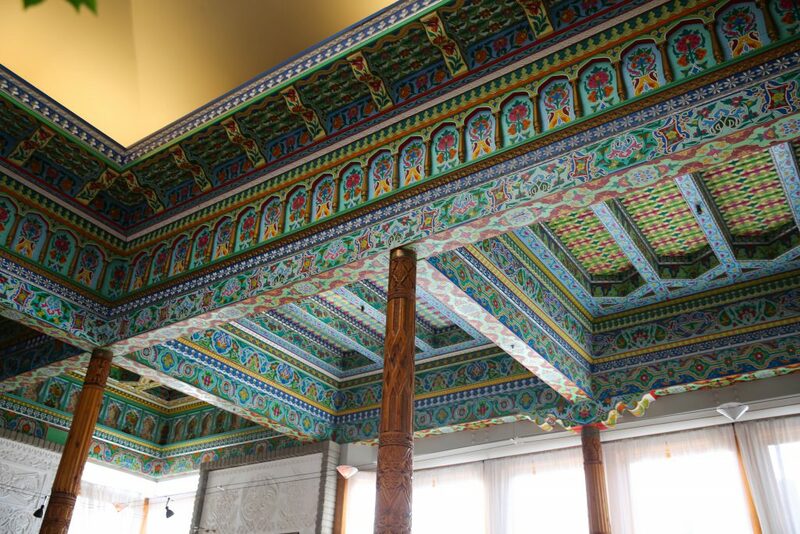 This tea house is a work of art itself, with its hand carved and painted interior and exterior. 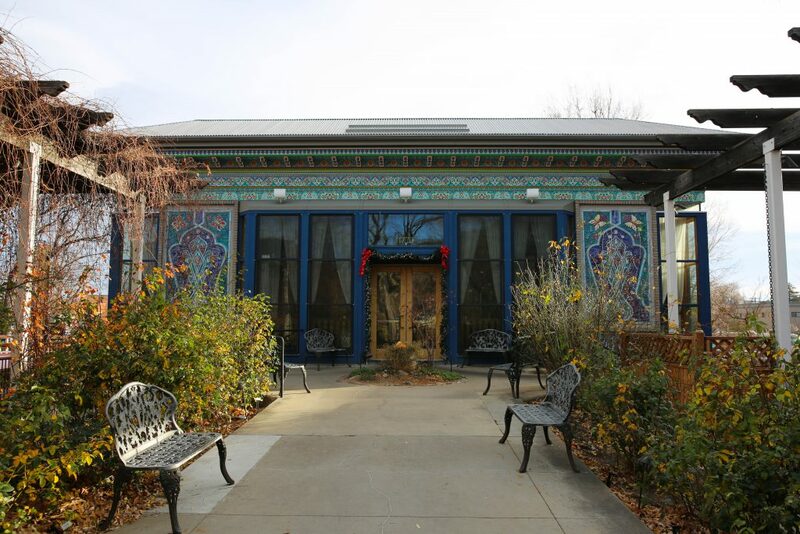 The Tea House building was a gift from Boulder’s sister city, Dushanbe Tajikistan. I didn’t even know sister cities were a thing. In exchange, Boulder gifted Dushanbe an internet cafe. The teahouse has a very creative and gluten free friendly menu and their servings are incredibly generous for the cost. It’s a fabulous place to grab a cup of tea any time of year because they have a HUGE tea list. I’m not a fan of tea but I can definitely get behind some chai and their chai was absolutely fabulous! 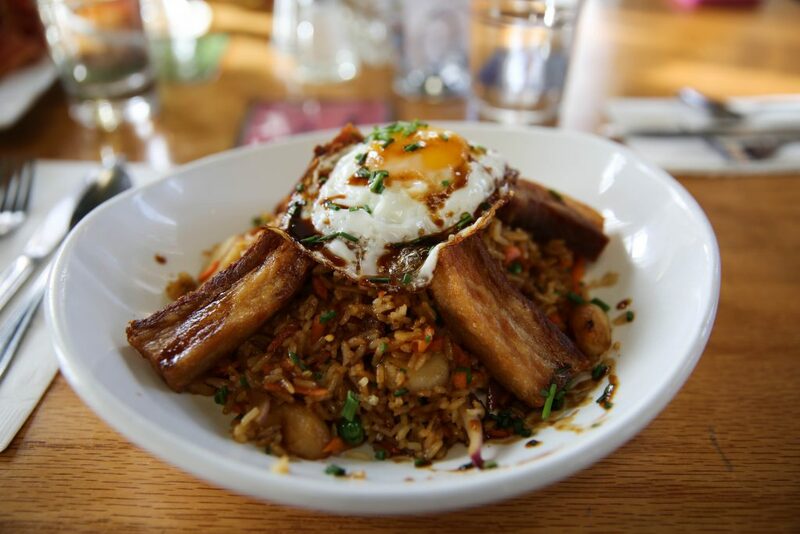 I tried the pork belly fried rice for breakfast and it was so.freaking.good. I seriously can’t wait to go back! Santo – I’m so glad I was able to try this restaurant since it was just a week old when I stopped in! 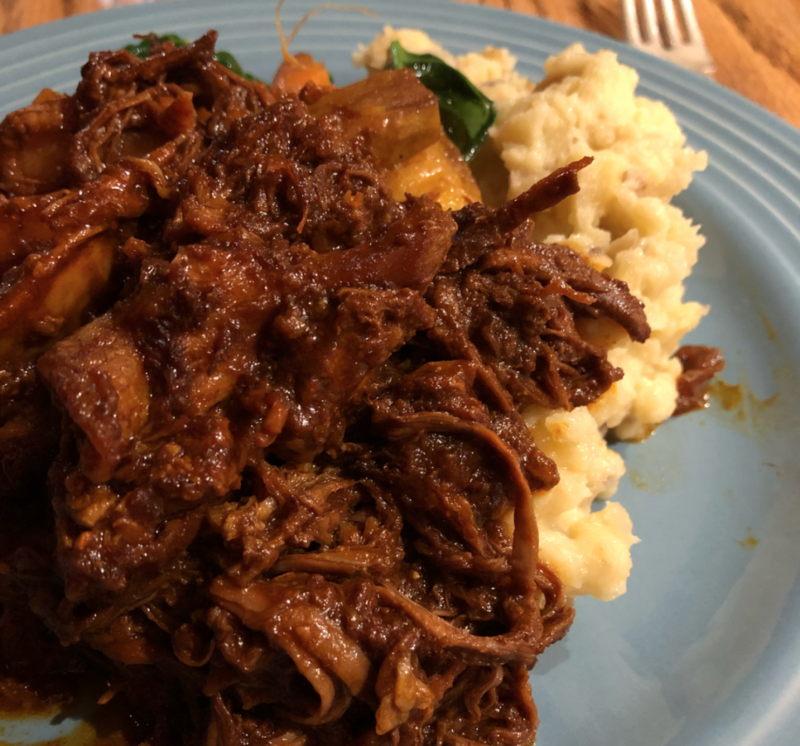 I’ve never tried out Blackbelly (which was highly recommended by many locals when I was traveling to Boulder), but the award-winning Chef Hosea Rosenberg of Blackbelly just opened this second restaurant concept. This restaurant serves seasonal, modern, northern New Mexican fare. Chef Hosea is a Taos, NM native so he brought his love for the food and culture into his restaurant! And everything on the menu was incredibly flavorful, colorful and delicious. I was over drinking at that point, so I didn’t try a cocktail, but I heard they are amazing too. If you are eating gluten free, just let your server know because they can do almost everything on the menu gluten free! 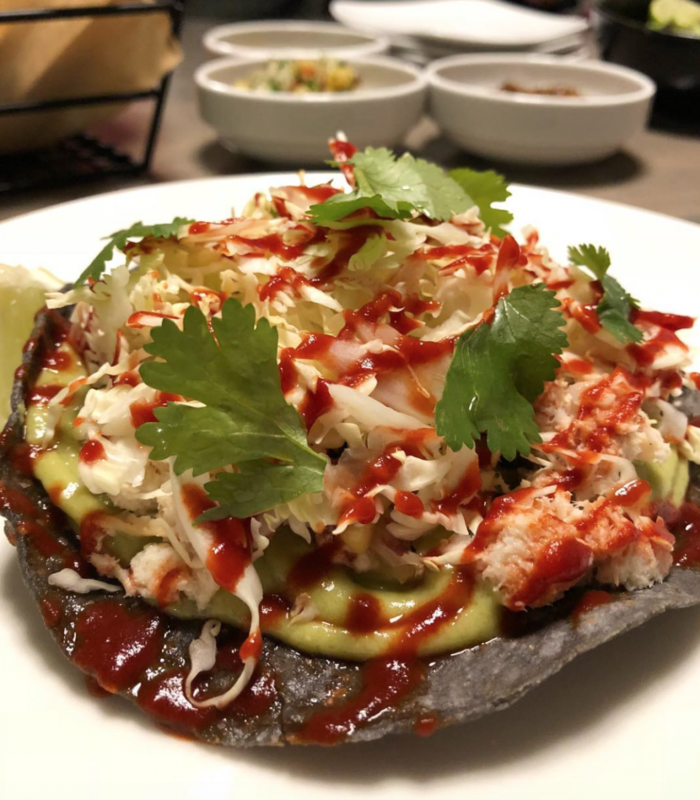 And when you’re there, definitely try out the trout tostada! It’s fantastic! 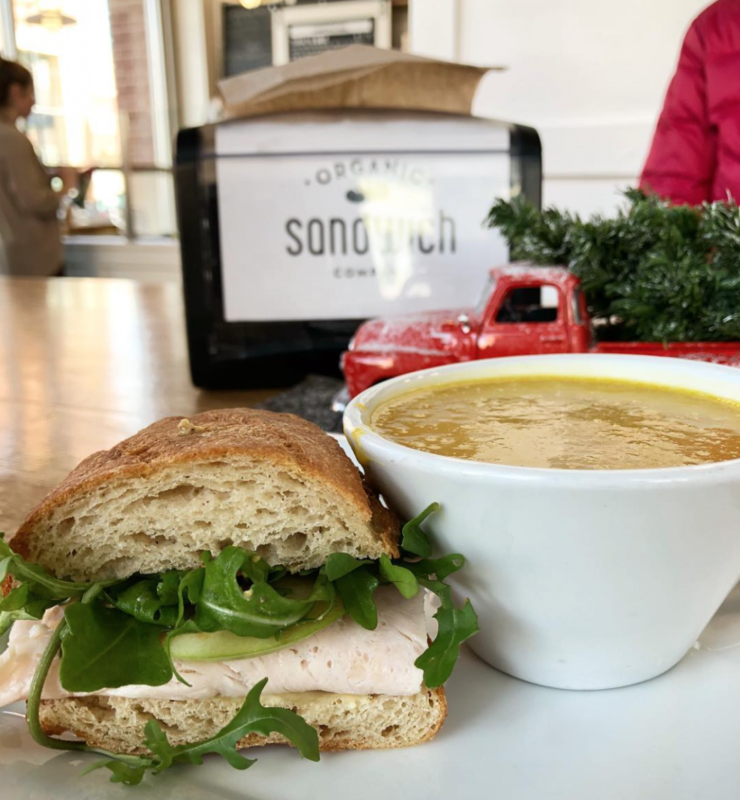 Organic Sandwich Company – I’m not a big sandwich guy. I can eat the meat and whatever else off a sandwich and be completely satisfied. And I find that almost every place that I’ve had a gluten free sandwich from has incredibly disappointing gluten free bread. Luckily I was NOT let down when I had an amazing turkey and brie gluten free sandwich at this adorable little sandwich shop. They have a ton of gluten free, vegetarian and vegan option to choose from. They also have nicecream sandwiches and paleo treats! If you’re interested in a solid sandwich, this place will not disappoint! 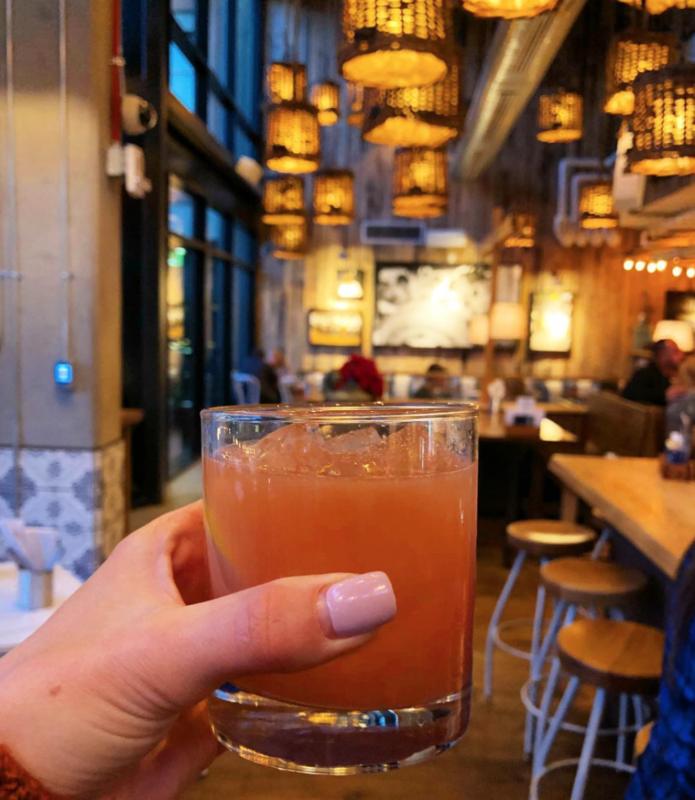 Bartaco – We only stopped in this restaurant for a drink but I’m so glad we did because I had the most flavorful, spicy and delicious margarita there. I ordered the red sonja which has olmeca altos reposado, myrrh quinquina (what the what?? ), ginger, jalapeño, lemon juice, and peychaud’s bitters. If I’m going to drink my calories, I want my mouth and fire. I want to remember my cocktail. And this one definitely packed a punch. I looooooved it. I also heard this place is great for food but I didn’t try anything so I guess I’ll have to go back soon! Rayback Collective – If you’re looking for a cool space to meet a friend for coffee or get some work done on your computer or eat some lunch or have a beer or throw around some bags….or really do anything with other people, this space is for you. Rayback was created for the community to come together in one space in a comfortable and unique environment. 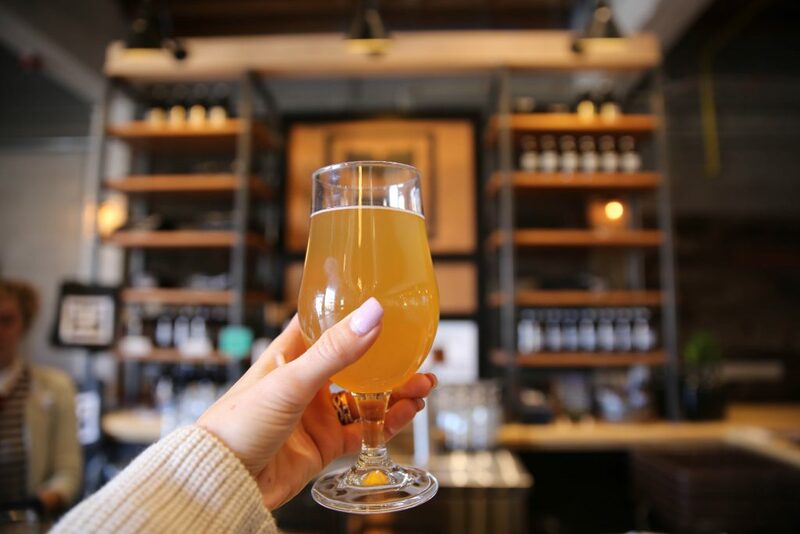 They offer multiple food trucks, a coffee bar, kombucha on tap, along with beer, cider and wine, live music, and outdoor areas to play or just hang out in front of a fireplace. I tried a kombucha on tap which was refreshing and delicious after a hike! 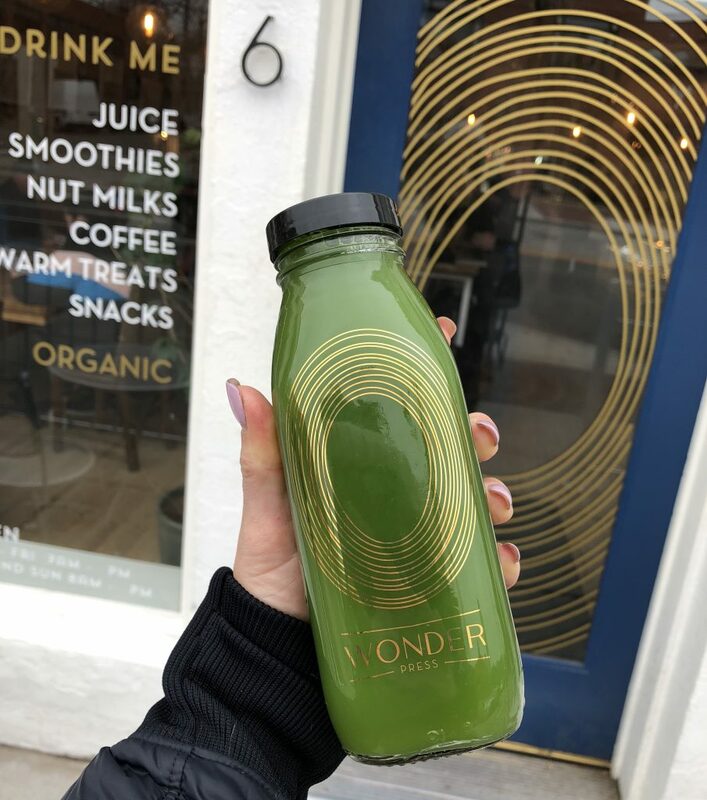 Wonder Press – This adorable juice shop offers some of the most creative and delicious freshly pressed juices you will ever taste. With flavors like yam cookie, charcoal thyme lemonade, yum yum latte, and cinnamon cashew, you’re bound to have a juice or drink that you’ve never tasted anywhere else. Each bottle consists of several pounds of produce and is packed with live enzymes, vitamins, minerals and other important nutrients. And something that’s so cool and different about Wonder Press (other than their flavors obviously) is that all their drinks are served in glass bottles that you return when you get your next juice instead of throwing away a crappy plastic bottle. 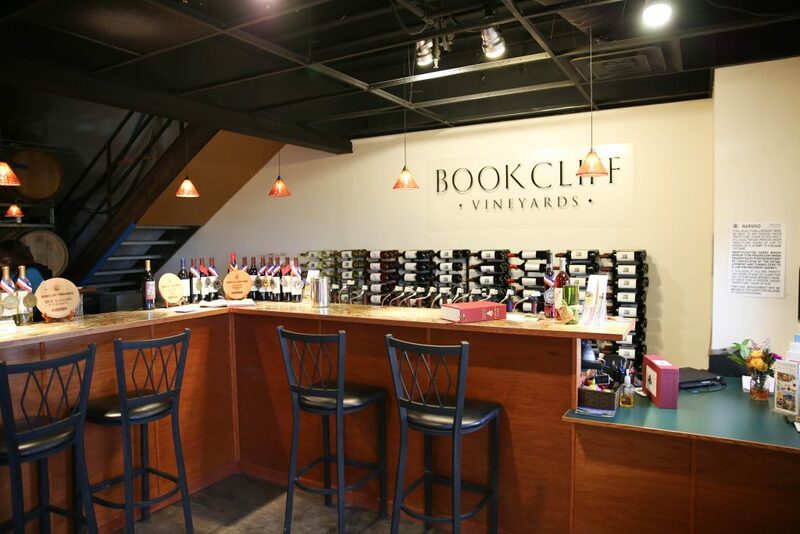 Bookcliff Vineyards – This winery was started by a couple named John and Ulla back in 1995 and uses only Colorado grapes! They own and manage 37 acres of vineyard growing fourteen different varieties in Palisade, CO. They offer Chardonnay, Viognier, Muscat Blanc (my personal favorite from their tasting room), Riesling, Orange Muscat, Merlot, Cabernet Sauvignon, Cabernet Franc, Syrah, Tempranillo, Petite Sirah, Petit Verdot, Graciano and Malbec. They do not use pesticides or herbicides to create a sustainable farming environment. I don’t know much about wineries, but I’ve never heard of other wineries doing that, which I thought was pretty rad. Their wine tasting room is also next door to Settembre Cellars and Decadent Saint so if you’re a wine lover, you can try a few Colorado wines when you’re traveling through Boulder! Peppercorn: This cooking supply store has EVERYTHING. Any kitchen tool, utensil, treat or condiment that you want to try or check out, they will have it! They even had my cookbook! Three of them! So cool! Alpine Modern: This adorable boutique offers super unique sleek gifts and products for the home and many things in between. This would be an awesome store to shop at for the holidays. Cured: This meat, cheese and specialty food shop on the east end of pearl is an awesome spot to grab a coffee and work. And once you’re done working, grab some of the amazing products like locally made chocolate and awesome paleo products! Chelsea – This is one of my favorite women’s boutiques in Boulder that has incredibly classy clothing and accessories. Go Hiking, Trail Running, Mountain Biking, Skiing, Rock Climbing, and More! One of the main reasons why Boulder is such a popular place to live is because of the amazing 45,000 acres of open space. And because of that, everyone who lives, works or simply visits Boulder is able to be outside year round. You can take a short drive up to the mountains to ski, snowboard and snowshoe or an even shorter drive and simply walk or run the trails, rock climb, mountain bike, or just frolic about the wilderness. 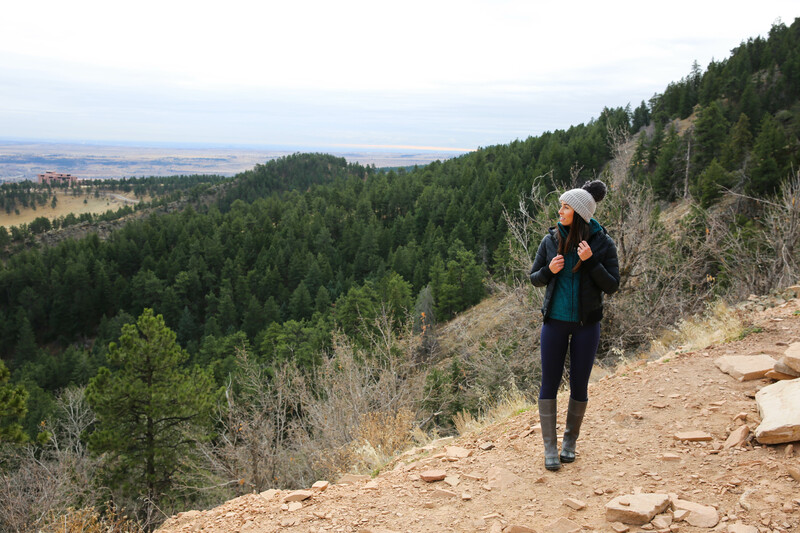 When I was in Boulder, I went on two separate hikes that were both super easy which was wonderful since I hate walking uphill for longer than 4 minutes. Ok, 2 minutes. 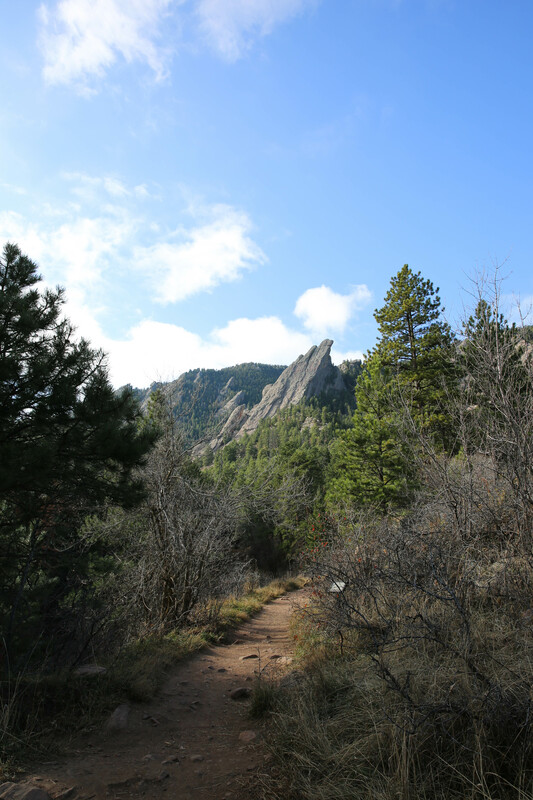 The first hike we went on was through Chautauqua Park which was established 1898 as a cultural and educational summer retreat. Many of the original buildings still stand like the auditorium, dining hall, academic hall, and community house. 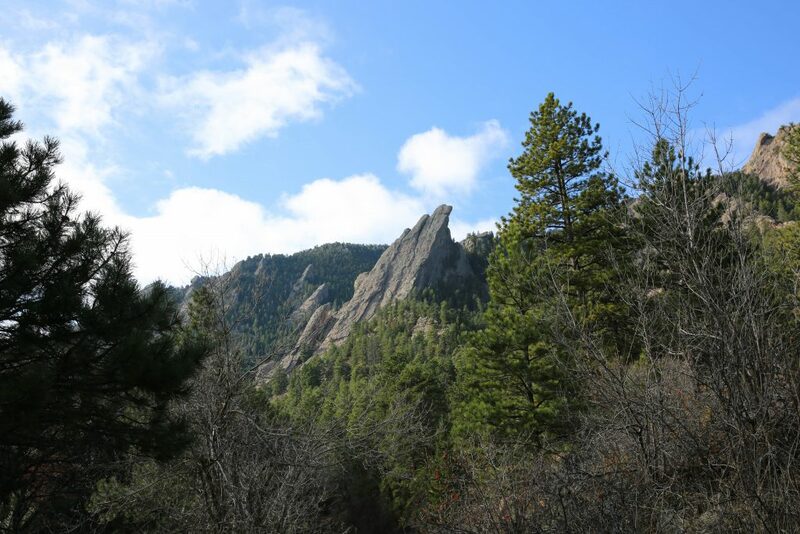 And just a few steps outside the park is a hike up the trailhead to the iconic Flatirons up to woods quarry. 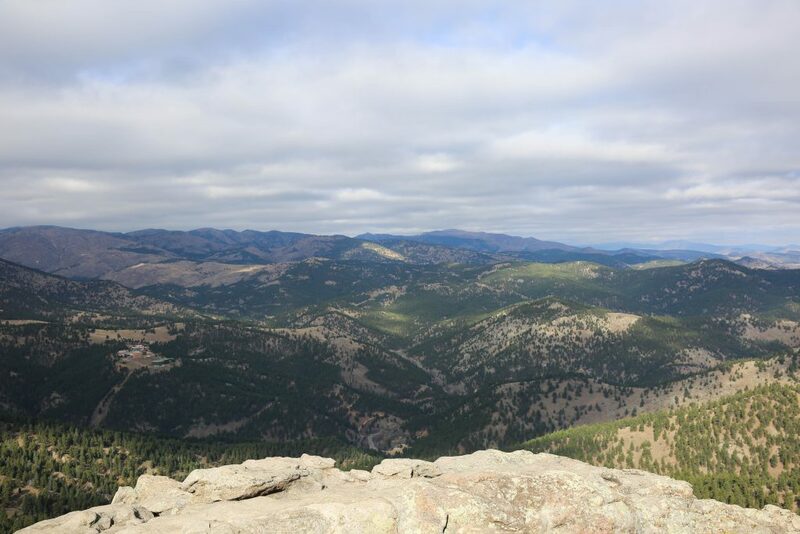 This hike is a pretty comfortable hike with some built in stairs and a summit with some rock seating that overlooks all of Boulder and even into Downtown Denver. Boulder is located where the mountains meet the plains and Chautauqua is located right at the base of the mountains. Here you’ll find Boulder’s iconic Flatirons. Boulder has 45,000 acres of open space—that’s nearly twice the size of all the skiable acres in all of Colorado. The trailhead is located a stones throw from the lodging at Chautauqua, one of three remaining functioning Chautauqua’s in the United States. Chautauqua is one of Boulder’s oldest treasures as it is a designated as a National Historic Landmark. Located right at the Chautauqua trailhead with concerts and educational events scheduled in its various venues throughout the year, it is a perfect blend of urban and nature. The second hike I went on was even easier than the first and is handicapped accessible, which I thought was pretty rad. The Fowler Trail in Eldorado Canyon State Park has you first drive through the adorable town of Eldorado Springs before entering the park. Along the trail there are tons of scenic binoculars to check out the wildlife or simply watch the badass rock climbers. If you are trying to get into trail running, this would be a great start! And you can take your pup on the trail with you, which is always more enjoyable. Just a heads up though, their is a park fee so come prepared with a little cash and lots of water! The thing about Boulder is that it’s unlike any other place. It’s a completely different culture that is so cool to be around. People there love their community, they love their environment and they are constantly trying to make the world a better place. The people in Boulder are just happy. It’s plain and simple. 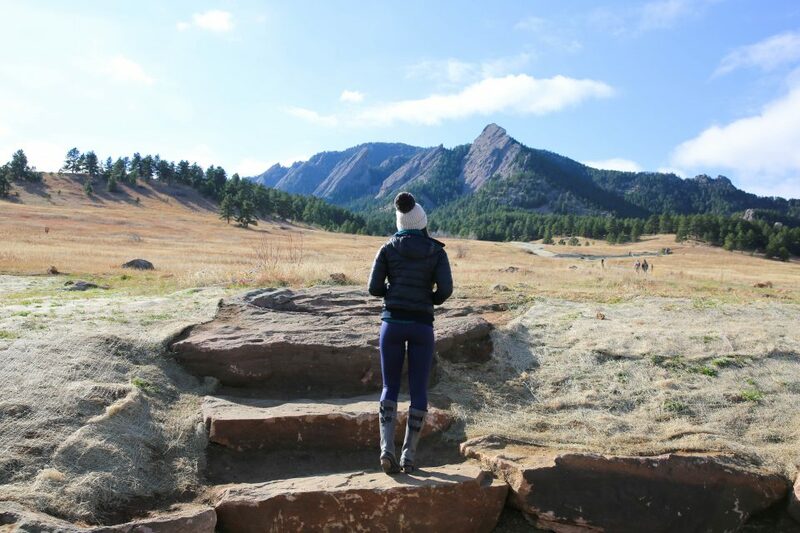 If you want to experience Colorado from a different viewpoint, head to Boulder because you’re going to be pleasantly surprised with the unlimited indoor and outdoor activities. And I love me some activities! Especially food activities. This trip was hosted by Boulder Convention and Visitors Bureau, but all opinions are my own! I really love these city reviews with recommendations! I always check your blog to see if you have one of those before I travel somewhere cause you have the rest resto recs. This is a great post, Juli! I love your blog for many reasons, but really appreciate your detailed city reviews! I grew up going to Estes Park every summer and have always wanted to live in CO. This post further fueled that desire! I’d love to hear your opinion about Denver vs. Boulder. I am from Chicago and love living in a city, which is why I’m leaning towards Denver, but I think I could make a home in either place. Although I’ll need a job first…I’ll tackle that hurdle when I come to it. well that’s tough. i think it may just depend what type of person you are. boulder definitely has a certain type of person and it’s kind of hard to explain. i love denver for having so many different areas to hang out in and restaurants and walkable places. plus you get all kinds of different people since you’re downtown. and even though Denver is still super expensive, Boulder is even more expensive to live. so that’s something to keep in mind. i’m biased to denver since i live here, but if you want to be even closer to the outdoors, boulder may be for you! Hi Juli – A quick warning about Organic Sandwich Company – their “gluten free” options are not Celiac friendly. I ate a sandwich there shortly after they opened, and got horribly sick. A friend who ate there recently noticed that all the same condiments are used for gluten free and gluten options, so there is cross-contamination. good to know! thanks for the info Annie! A wonderful post Juli! We are traveling there in July 2018 and planning on staying in Boulder for 5 or so days (2 of which we’ll be back and forth a bit to Golden for a wedding). I didn’t see any GREAT stay options in Golden (unless you know of any???) so for now planning to stay in Boulder. Also, do you know anything about The Bradley Boulder Inn? I’ve heard good things about it too. More like a cross between a B&B and boutique luxury hotel. i’m from Golden so i see it totally different. i don’t find golden cool because it’s my hometown and i HATE going back and seeing people i grew up with, who never left lol. so i would definitely stay in boulder. it has WAY more options. and no, i don’t know anything about the Inn, i’m sorry! and no idea about vail or glenwood, i always just go for days to those places so i’ve never stayed overnight. sorry i can’t help more! Thanks Juli, I understand. And I decided it will be most fun to stay in Boulder and commute to Golden for that event, as you suggest. I do hope to see Vail though. Love Boulder!!! Quick question….have you ever explored Sedona? Headed there over spring break to explore, looking for some insider tips!!! Hope you’re enjoying Cabo!!! i haven’t!! it’s definitely on my list! i’ve explored Santa Ynez Valley which is wine country and it’s absolutely amazing! Awesome post! I love Peppercorn and Bartaco and always have to take guests to both of those and the teahouse. I just moved to Boulder in November and started my blog a few weeks ago. You’ve inspired me to do a what-to-do-in-Boulder post! Next time you’re up here I suggest you go to Bitter Bar or License No 1 for a drink. I also think you’d really enjoy Blackbelly for dinner. OH…and Brasserie Ten Ten for happy hour. Also…not sure if you come up here often, but you can get an off leash dog tag for Jackson if you trust him to run around at Chautauqua. I got one for my frenchie! It’s awesome there. Maybe we’ll see you two around! thanks for the recommendation!! i need to take him up there sometime! 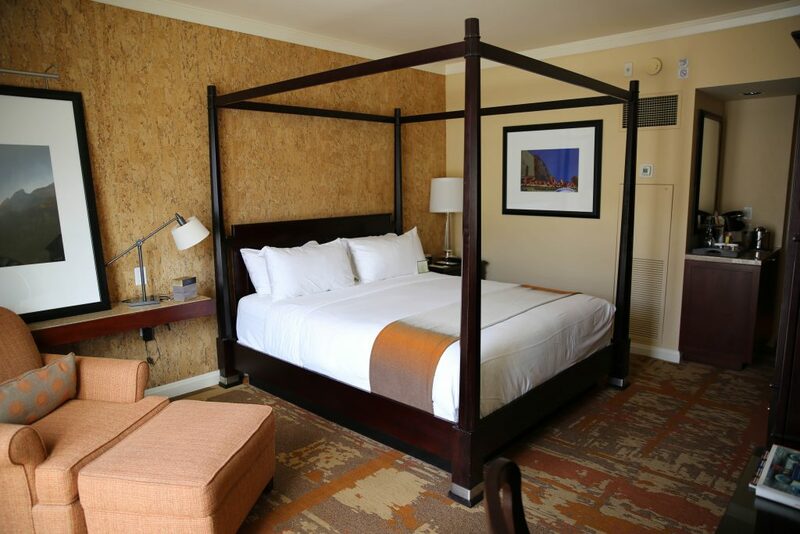 We just returned from Vail and Boulder and loved every minute of our stays. In Boulder we’d booked a King Veranda St Julien back in Nov, before this post, and we agree with you — it’s very nice and the location is hard to beat. We didn’t make it to all of the food places that you recommended, but we LOVED Wonder (we had smoothies, dandy coffee, tea and regular coffee). At Bartaco we shared a plain margarita and after two tiny sips I felt my head was going to spin off. Incredibly delicious and STRONG. We had tacos and lettuce wraps and they were delish too. Also noticed they offer plantain and other yummies. Highly recommend Bartaco! You didn’t rec Salt, but I’ll say that it was just meh. Adored Brasserie 1010 and ate there 4 times because the food and service were so excellent and it was so convenient. Not strictly paleo, but they gladly customized for me to meet my dietary needs. Bouillabaisse and all of the salads are excellent, as it the hangar steak. Excellent service there. A place that you didn’t mention, but I heartily recommend is Tangerine — amazing breakfasts and lunches and everything on the menu they offer as gluten free, including English muffins for their Benedicts. They only use ghee and non GMO sunflower oil, butter and other good fats. They aren’t near downtown — something like iris and 28th — and they have another location in Lafayette. It was so good that we drove over there 4 times — 3 times for breakfast and twice for lunch. They even made a to go lunch for us while we ate breakfast so that we could eat it on our veranda after our hike and before we cleaned up to attend a wedding because we knew that we wouldn’t have time for a sit down lunch at a restaurant. Can’t say enough great things about Tangerine. Vail was utterly spectacular in every way too. We can’t wait to return to both towns! Oh, also in Vail is the ONLY corporate Lole store in the US. I’d been looking for the Lole bags, but couldn’t find them anywhere on the west coast. On our last day in Vail we were going to a great coffee place in the central village and I stumbled across Lole by accident. What a great store! I got both of the bags that you featured on a blog post, both in black — yes, boring, but very functional and they won’t show dirt. I loved the bags in the colors that you chose too. Check it out next time you’re in Vail and getting coffee at Yeti’s Grind!